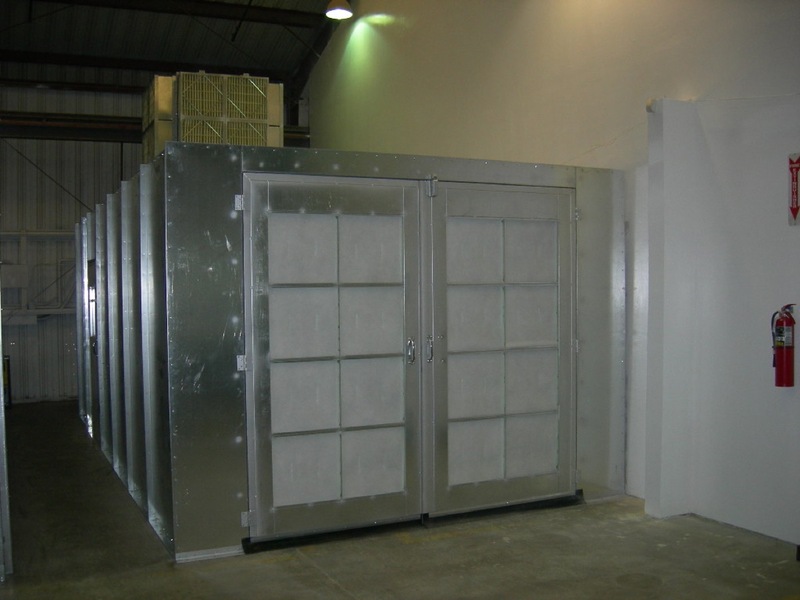 Our powder application booths are built in the USA specifically for powder coating use. 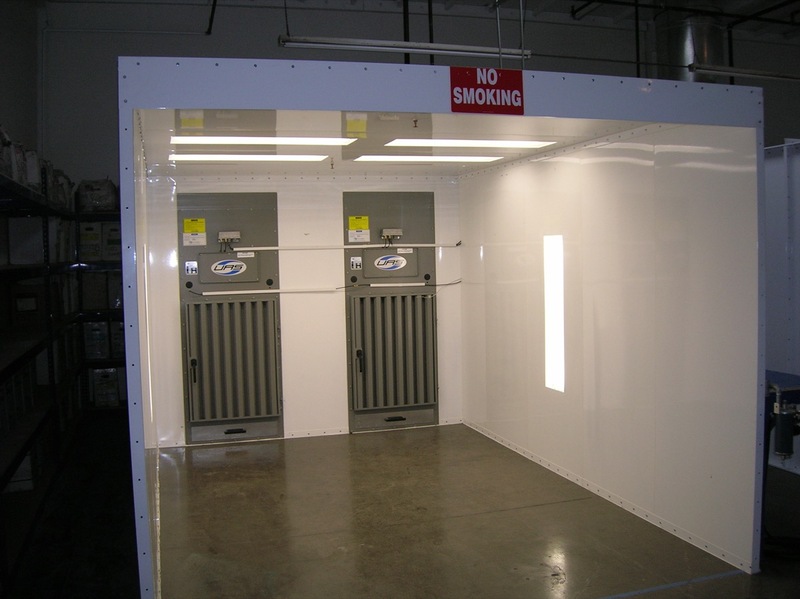 With over 150 standard models our spray walls and batch booths are great for any size, including shops working with auto, truck and motorcycle related coating jobs. 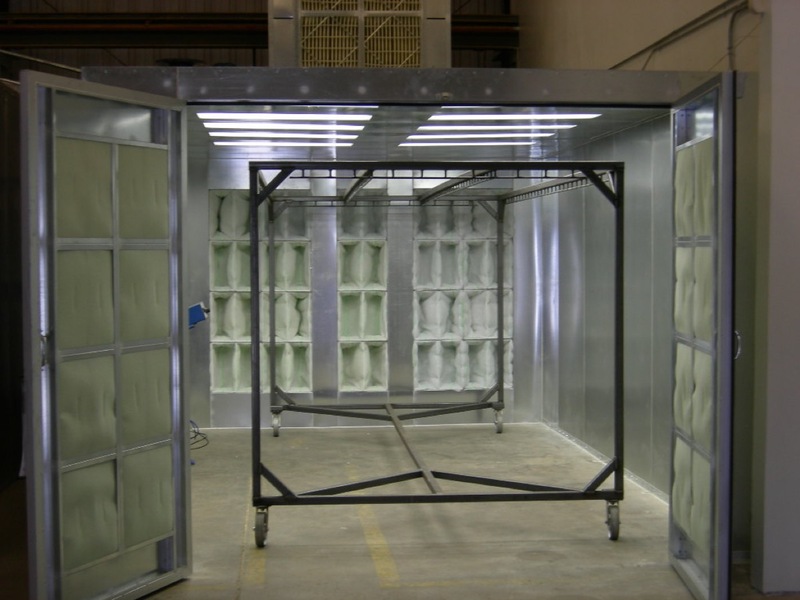 We also offer larger booths for aviation and heavy equipment coating systems. Immediate delivery available on many common sizes. 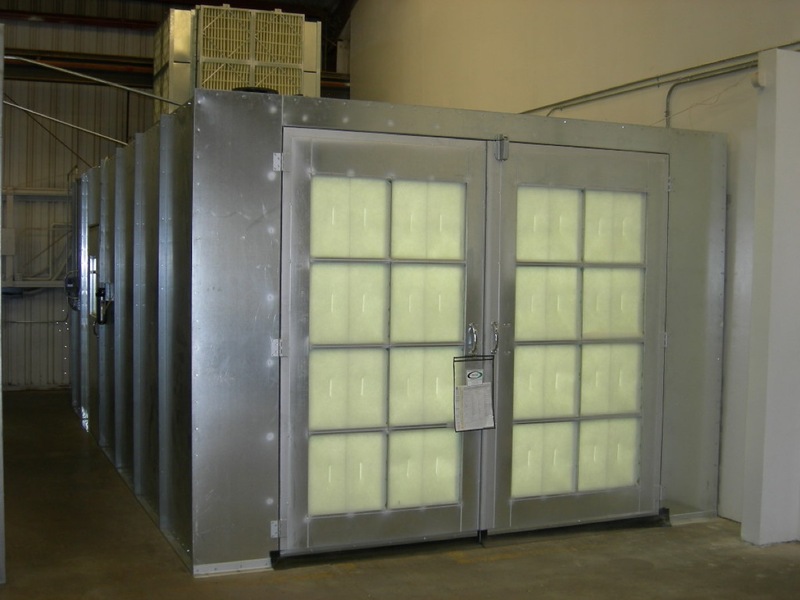 Options include VFD controls, solid or filtered doors, and true HEPA filtration. Custom sizes, conveyors, and fire suppression integration also available. The booth walls and roof are made of 18 gauge or thicker steel that has been G90 galvanized. The booth utilizes a single panel design. The walls and roof are connected via a track system. The booth is bolted together and the exhaust system is integrated into one or more of the booth’s walls. Threaded inserts in key parts help simplify assembly. No field welding is required. The spray enclosure includes roof-mounted light fixtures designed to accommodate four standard 48” T-8 bulbs. These fixtures are mounted on special panels that include factory-provided reinforcement. The light fixtures are mounted in the field over sheets of ¼” tempered safety glass that are sealed in place. The light fixtures are accessible only from the booth’s exterior. The exhaust unit is included in the exterior dimensions for the booth. The booth uses either one or two floor mounted exhaust units. 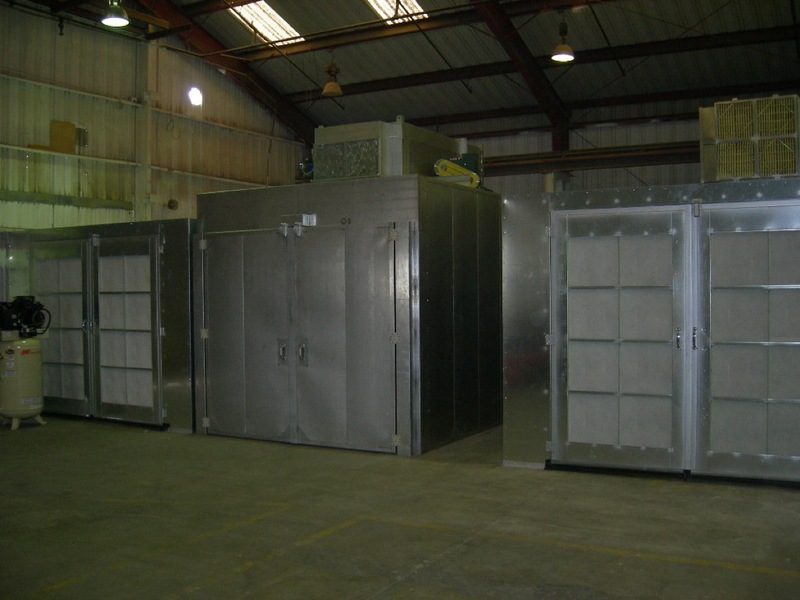 The exhaust unit is constructed of primarily 16 gauge and 18 gauge G90 galvanized steel. The exhaust system utilizes a belt-driven tube axial fan and includes a two stage or three-stage filter system to draw air through the booth enclosure which will either exhaust the air to the outside or return it to the shop atmosphere. The exhaust unit uses an ASHRAE/NESHAP type system consisting of a primary blanket filter, a set of polyester cube filters and a set of HEPA type final filters. The exhaust unit is designed to draw air from the lower 1/3 of the wall of the booth, resulting in semi-downdraft airflow. The booth ships with tackified 1” blanket type pre-filter media, 24”x 24” x 12” duo-ply polyester cube filters, and optional 24”x 30” x 6” true MERV 17 HEPA filters with integrated galvanized metal housings. The booth is operated via a simple control panel in a NEMA enclosure. The control panel allows the operator to stop and start the exhaust fan and turn the lights on and off. The control panel includes over-current protection. Upgraded models include adjustable airflow via a face-mounted VFD control knob. Exhaust duct is not required when HEPA filters are used. Light bulbs, parts for electrical service connection to the control panel, and field wiring components are provided by other companies and are not considered part of the deliverable.